On behalf of the IBA Alumni Community, we would like to congratulate Mr. Mohsin Ali Nathani, Alumnus of Class of 1987, on becoming the CEO of Habib Metropolitan Bank Ltd.
Mr. Nathani has been serving in the banking industry for more than 25 years; he was the CEO of Standard Chartered Bank PLC, UAE after becoming the CEO of Standard Chartered Bank Pakistan. 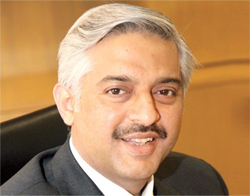 Prior to this, he has served in Barclays Bank Pakistan as its Country Head and Managing Director. Mr. Nathani is an aspiring role model, an exemplar, for the students of the IBA and fellow alumni. We are proud of his achievements and are thrilled about his new role. We would like to wish best of luck to Mr Nathani for his newly appointed position and future endeavors.